This FAQ addresses some of the questions I get asked quite a bit, as well as some that I've never been asked, but I'm going to answer anyway, as is the case with most FAQ's (Unless people really want to know when the soundtrack CD for "Loud Static Feedback - The Movie" will be released?). Actually, it's more of a place for me to say stuff that has no real place on any of the other pages, but needs to be said. Why are there so many dinosaurs found on the Isle of Wight? How do dinosaur bones fossilise? What age are the islands Dinosaurs? How can you tell all this from a Pile of Old Bones? How do you become a palaeontologist? Why did you decide to create a website about the dinosaurs of the Isle of Wight? Where is Vectisaurus in the main list of dinosaurs? What about Megalosaurus? Can't you find them on the Isle of Wight? Do you sell fossils and if so, how much do you charge? Where does DinoWight stand on the evolution-creationism debate? Why doesn't DinoWight include the mammoths found at Compton bay, or any of the fossils from Whitecliff or the other Cenozoic sites? Where can I stay on the Isle of Wight? What is the best music to look for fossils to? Just HOW proud are you about finding that trilobite in Estonia? There are many definitions of what a dinosaur is. Dictionaries usually define dinosaurs as "large land-based reptiles that lived during the Mesozoic era 270- 65 million years ago", although this could also include other large reptiles of the Early Triassic, before dinosaurs. Anatomically, dinosaurs are referred to as being "diapsids (animals with two post-orbital fenestra (holes behind the eyes)) with no postfrontal bone, the jaw muscles extending to the frontal, The head of the quadrate exposed in lateral view, epipophyses on the cervical vertebrae, paired sternal bones, a large deltopectoral crest extending 35% or more of the length of the humerus, the lesser trochanter being on the anterior side of the proximal end of the femur, a partly open acetabulum (which may be convergent in different dinosaur groups), an asymmetrical hand with the outer digits strongly reduced (except in the ornithischians and sauropods), an ascending process of the astralagus that keys into a slot on the distal end of the tibia (I only had to look up the last three- don't I feel clever!). Finally, there is Hollywood's definition, which states that a dinosaur is "A large scary lizardy monster with sharp pointed teeth that eats people and can make lots of money if put on a cinema screen", as is the case in that classic piece of high-brow palaeo-cinema "A Nymphoid Barbarian in Dinosaur Hell". At DinoWight I go with the first two definitions, as that film was the biggest pile of pants ever (after Disney's "Inspector Gadget" and "The Avengers" of course). The majority of Isle of Wight dinosaurs are found in the Wessex Formation, which was part of a massive river channel and in a flood basin. With lots of sediment being washed into the area during seasonal floods and bursting riverbanks, there was more chance of a dinosaur's body being buried, and so fossilising. See this page for the answer, as I can't be bothered to write about the poor dead dinosaur falling in the river, getting buried in mud and the bones being replaced by rock while the soft parts rot away, leaving a skeleton. The Dinosaurs that are found on the Isle of Wight are mainly Barremian, which puts them about 120 million years ago. The Barremian age is a division of the lower Cretaceous period, which is the upper part of the Mesozoic era, which in turn is the middle part of the Phanaerozoic. The divisions are underlined here because they are NOT interchangeable, so anybody talking about the Jurassic era is talking pants. It's called palaeontology Deary. Basically the bones are examined for muscle scars, capillary holes, damage caused by injury and predation, and similarity to those of extant (living) organisms and other known dinosaurs, then the shape of the animal can be reconstructed. Behaviour is deduced from a combination of examining the stresses on the bones, brain-case shape, any adaptations similar to those of modern organisms, trace fossils, such as footprints and resting traces, coprolites, regurgitates (vomit), the position of the bones in relation to its environment when in situ (still in the rock), comparisons of all these and several other features with modern animals, and occasionally some reasonable speculation. Of course, this is a simplified list, as the science of palaeontology is hugely complicated, but even then there is a slight chance it's wrong, and we'll never get colour preserved, but otherwise it's fairly accurate. GET OUT! I am not an archaeologist, as they deal with human civilisation, dating back to Ancient Egyptian times. I am a Palaeontologist, or Palaeo, and I deal with animals that have been dead a very long time, and the entire history of life on this planet. Admittedly, my interests are based more on dinosaurs, but I had to learn all about Palaeozoic animals such as trilobites (woodlouse-like creatures) and graptolites (little hacksaw blade-like fossils, basically scum on a stick). Archaeologist and Palaeontologist are NOT interchangeable terms, though occasionally there may be a slight overlap. So if anyone talks about archaeologists working on dinosaurs, put them straight! Think of it as similar in the way an airline pilot is similar to a space shuttle pilot, and you get the idea. A lot of palaeontologists are "amateurs" (although many know more than some professionals!) who do it in their spare time, as is the case with most of the Isle of Wight's local collectors. However, if you want to become a professional palaeontologist, it's not as easy. First, you need to get good GCSE's, which get you onto doing A-levels, preferably in Sciences, especially Biology, Physics and, if possible, Geology, but many Colleges and Schools with sixth-forms have phased out any geological influence. Once having these, you can either apply to do a geological or biological first degree, or even a combined first degree in geology and biology, as the University of Bristol offers, or do one of the few palaeobiology degrees offered at Imperial College, London, and The University of Portsmouth (Where I did it, and can recommend if you like seaweed). There may be others, but I am unsure where, check www.ucas.co.uk for information. Having got your BSc in Palaeobiology, you can then continue and do a postgraduate degree at Bristol, Imperial or any of the others, as it is much more common at postgraduate levels, or go out into the real world and get a job in museums, but be aware that there are not many jobs for vertebrate palaeontologists. The Isle of Wight is one of the main sources of dinosaurs in Europe, and it was convenient when I was studying in Portsmouth. My first real introduction to the islands dinosaurs was in 2000 when a few others and myself where invited by Dr Dave Martill to assist with the excavation of an Iguanodon at Barnes High. After spending most of the day digging, sludge-surfing and picking through clay, we finally had a vertebra to take back to Portsmouth. Unfortunately, the cliffs conspired to bury the bones that were left in the rock, and then when permission was requested to excavate them, it was refused and the vertebra we extracted was demanded back by the landowners. My interest was increased while researching for my dissertation in 2001, in which I was at the time attempting to find remains of Hypsilophodon in the Hypsi beds. It was around this time that I was thinking of writing a book on the dinosaurs of the Isle of Wight, but then I discovered that one was already in preparation (this one), so that idea went out of the window. One thing that I noticed during my research was that Isle of Wight dinosaurs where severely under-represented on the internet, with only the Museum of Isle of Wight Geology website and the (at the time) unfinished Dinosaur Farm Museum website.It was my fellow student and member of the Famous Five Adam Smith (who runs the "entertaining" Dinosaurs and their Biscuits website and the informative Plesiosaur Directory) who suggested that I create a website with some actual purpose. Originally called simply "Dinosaurs of the Isle of Wight" (created before the book of the same name was released, I hasten to add! ), it featured only seven dinosaurs- Iguanodon, Neovenator, Baryonyx, Eotyrannus, Polacanthus, Hypsilophodon and Yaverlandia, and was produced using the PageWizard at www.geocities.com and what information I could get from DinoData and the Dinosauricon. This was concise, but looked quite awful, as you can see. Since then, I have been able to get my hands on the papers, as well as the book that killed off my plans, which has enabled this web resource to be created with some real science. Now called DinoWight, I aim to include every known dinosaur from the Isle of Wight, from Aristosuchus to Yaverlandia, as well as anything else that was alive and interesting in the Barremian. This is the website that you see here. Since DinoWight was first created in June 2001 it had been featured on the Isle of Wight Index, the Dorset Dinosaur guide for Grockles and has received visitors from all across the world, including the USA, Australia, Germany (mostly from Trevor Dykes, a friend of DinoWight), Brazil, Canada, Portugal, Mexico, The Czech republic, Northern Ireland, Japan, (where DinoWight's Thecocoelurus page is linked to on this website but be warned, it's in Japanese!) Belgium, Oxford University (oh, alright, she's an old friend of mine) and Blackgang Chine. It has also recently been included in a suggested website for students of the University of Sussex, The BBC's British Isles - A Natural History website, and the resources page for the Channel Four Palaeo-Time-Team-style programme Big Monster Dig. Some people are under the impression that I created DinoWight to try and sound clever, and get people to think I knew lots about dinosaurs using information that they have provided without crediting them. Well, in reply to these criticisms, I created DinoWight simply to share information that has previously only been available to academics and those with the money to buy relatively expensive books. As children are generally more interested in dinosaurs than adults, and those in the UK are told virtually nothing about Britains prehistoric heritage, although such schemes as the Bristol Dinosaur Project and Dinosaur Isle are doing something to correct this, it seemed hypocritical that only adults were being given access to information. Therefore I created DinoWight as a place where everybody, the academics, the children with the internet at school, people in other countries and anybody else with an interest, to find out about the dinosaurs on our own doorstep. Of course, I do enjoy it when I get praise for DinoWight, but I never forget that this website could not exist if it were not for the information. Basically, I didn't make DinoWight for Me, I made it for You. Vectisaurus is a synonym of Mantellisaurus atherfieldensis. For those who don't know how the naming of animals goes, every species on earth has a scientific name, from humans (Homo sapiens) to rats (Rattus rattus). Some of these are quite amusing, such as the orang-utan (Pongo pongo), but I digress. As you may have noticed on the dinosaurs pages, after the name there is a human name or names (e.g., Oplosaurus Gervais, 1852). This name belongs to the scientist who named the animal, and is a way of achieving immortality in the scientific world, as this name will be used whenever the animal is mentioned in a scientific paper. Some scientists get a bit over-zealous with the naming of things, and tend to be known as "splitters", using the minutest difference to erect a new species. This was the case with Vectisaurus, and in nomenclature (naming) it is the name coined first that has priority. This is probably due to the opposite of the above happening, a process called homonymising, or "lumping", which I tend to do. When dinosaurs were first discovered, there were only really three recognised, these being Iguanodon, Megalosaurus, Hylaeosaurus. Because of this, any dinosaur remains found were attributed to one of these four, examples being Hypsilophodon (Iguanodon) and Polacanthus (Hylaeosaurus), so it is likely that Megalosaurus material on the Isle of Wight belongs to Neovenator, as much Megalosaurus material around the world has turned out to be something else. 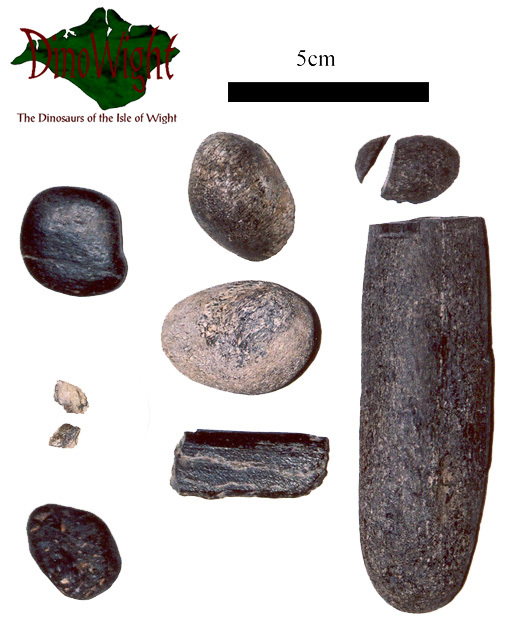 Well, firstly, it's from the Greensands of the Isle of Wight, a marine deposit, and is younger than the Barremian, so is outside DinoWights remit ('?Titanosaurus' is actually a dinosaur from the Isle of Wight, so it's included). Also, and no disrespect to the hugely talented and wonderful staff at Dinosaur Isle, but I fear that they may have, if not misdiagnosed their ichthyosaur material, fallen into a nomenculative trap. The genus Platypterygius is known from the Cretaceous, a period from which not much ichthyosaur material is known. As in the early days of palaeontology, when all ichthyosaurs were referred to the genus Ichthyosaurus, palaeontologists have got into the habit of referring all Cretaceous ichthyosaur material to Platypterygius. Of course, it may be that the Isle of Wight ichthyosaur material is Platypterygius, but until someone publishes it, we won't know. The basic answer is no, firstly because I feel that trading in fossils is pointless if there is no exact stratigraphic information to assist scientists in finding the rest of the skeleton, if the fossil is that of a vertebrate. Secondly, my fossil collection is mostly Estonian Palaeozoic in nature, and my Isle of Wight fossil collection is fairly pants and full of rubbish no-one would pay for and finally I think that it's much more fun if you look for fossils yourself, as you know that you where the first human being ever to see that specimen. PDF stands for Photo Deluxe, erm, File? Personal Document File? Whatever it stands for ("Portable Document Format", apparently! ), a PDF is a bit like a Word document, allowing you to read text but preventing you from altering it. It also has the advantage of not carrying macroviruses, which can be a problem with .doc files. You will need Adobe Acrobat Reader to read PDF files, which is probably already on your computer, but can also be found at http://www.adobe.com. Oh, and it's free! In the Evolution Vs. Creationism debate, DinoWight stands as far away as possible. However, I personally do notice that scientists tend to try to convince creationists that evolution is right, whereas creationists try to convince the public that creationism is right, and tend to use public misunderstanding of scientific terminology against evolution, as well as failing to provide any physical evidence, just claims that there isn't enough dust on the moon or something like that. Oh, and the claims that Parasaurolophus could breath fire because it has a vague similarity with the weapon of a bombardier beetle are just pants. I'm still waiting to hear from Kent Hovind about my query about the lack of dinosaurs in the Roman Coliseum. Anyway, next question. You've just answered your own question. DinoWight is about dinosaurs (see above), and there are no Cenozoic dinosaurs, with the possible exception of birds. There are pterosaurs and a pliosaur on DinoWight, but only because they are related and extinct (And yes, I know that I've started including other animals and plants, but they're all from the Wealden, and that's where I'm drawing the line. Very, and I'm going to tell the whole story here, even though everybody I know is sick of it. When we arrived in the Päri quarry, we started the day by counting stromatoporoids (lumps of algae). Once finished, we had the chance as usual to have a look for fossils in the piles of rubble deposited at the far end. Bob, the king of palaeontological photography (see photo on the about Me page), informed me that while we were just looking, he was going to try to find a trilobite, as only two had ever been found at that locality. Knowing this, I decided that if I found one, I would let Bob have it. After a short time, in which I found some brachiopods and a bit of bryozoan, I saw on a boulder what was clearly a trilobite cephalon (head), emerging from the rock. Realising I'd found what Bob was after, I called to him that I'd found something (well, actually, I shouted "OI, BOB, TRILOBITE!"). Bob followed shortly after, and he removed the most part on the boulder so that the fossil could be carried. I at this point decided that as Bob had been so desperate to find a trilobite I would donate it to the University of Portsmouth, as they would have more use for it than I. Then, due to the scientific importance of the fossil, mainly the fact that the trilobite faunal list for the quarry had increased by 50%, it was donated to the Estonian Department of Geology, where it is today. And that, ladies and gentlemen, is my contribution to science, apart from this website of course.